In general I try to keep the installation on Mac OSx as simple as possible. And in general it's no more difficult compared to Windows. However some things might not be easy at the first time, so here comes an installation with screenshots for each step (mind I personally don't have a mac, so I took the screenshots from a remote computer running OS X 10.6.8 (Snow Leopard) and Basecamp v. 4.0.4. This is a guide for Dummies, so it is quite long. You will actually find all of this very easy I hope and keep in mind, this guide is written for people who never used Garmin format maps on their Mac. If you have experience with other maps, You will only need to read through Step 1, Step 2 and Step 5. However you might find the general information at the end useful too. If I talk about right-click, I mean secondary click. If you don't know how to do that on your Mac, google it up - you miss out on many features without it in general. In general it is done by CTRL & Click if your mouse has no right click button. During the setup, the settings page should popup, tick: "7-zip Archvie" - as shown below. either "Never" or "Only if there is more than one top-level item" is selected. Then just doubleclick on the mtbCOUNTRY_macosx.7z (in this example mtbtawain_macosx.7z). It will be extracted as mtbtaiwan.gmap. Double Click on the unarchived download. It is called mtbCOUNTRY.gmap (COUNTRY standing for the country you downloaded). Note on newer Mac OSx version doubleclick may not open MapManager - use right click instead - then select "open with Garmin MapManager". Usually, but not always, once installed MapManager will popup - here you can see the full name of the map (in this case openmtbmap_taiwan_11.01.2013) and on the right site the place where it is installed to - this place is /Users/YOUR_USERNAME/Library/Application Support/Garmin/Maps/mtbtaiwan (taiwan in our example, germany would be mtbgermany, and so on). If we click on an entry, and then rightclick, we could uninstall a map from here. Also we can open the installation directory for any map from here - which is very useful and needed later on. If it doesn't pop up, installation should have been successful too. Here you can see all your installed maps, and if you want to remove a map, open MapManager, right click on the map, and Remove/Uninstall it. Alternatively you can install them to: /Library/Application Support/Garmin/Maps/ (top level - not inside your user folder). Both Locations are perfectly fine - but best only use one of them for all of your maps. If you have the same country map in both locations - you are asking for trouble. 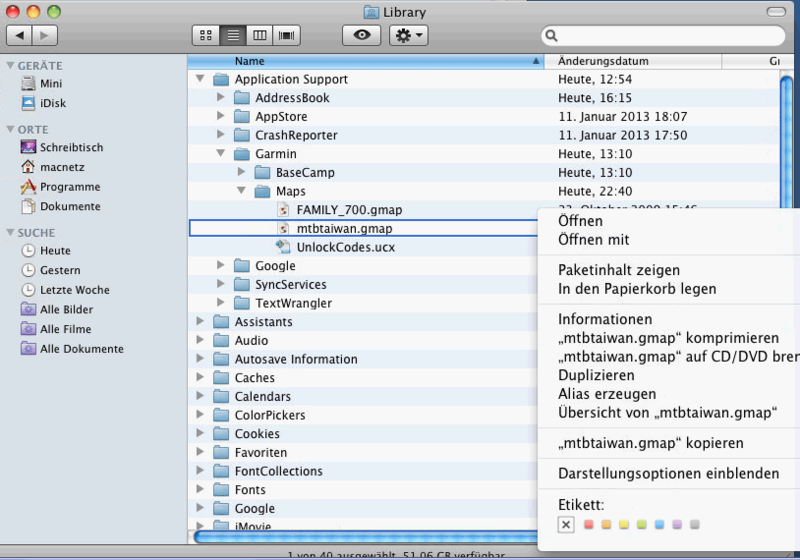 (also see the map manager Screenshot above - actually MapManager does nothing else than move the .gmap package (folder) for you - once it is placed there - it will be found by Basecamp). ~ being your home folder. 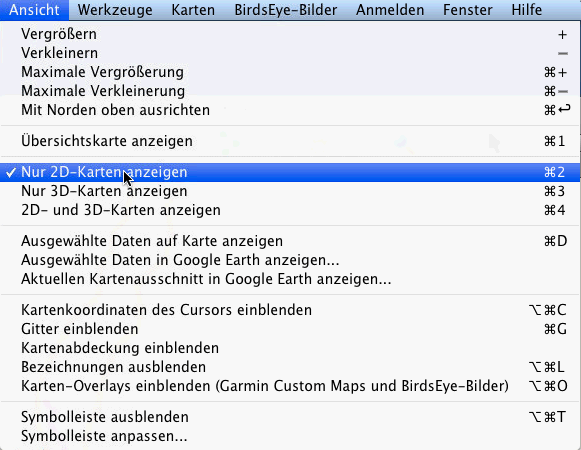 When you startup Garmin Basecamp for Mac, it will show you the last installed map (or the map you last used Basecamp with). In our case - this is the map of Taiwan. Now you can zoom in and work with the map just like any other map. If it's your first time, best play around a bit and read the manual if you're unsure. 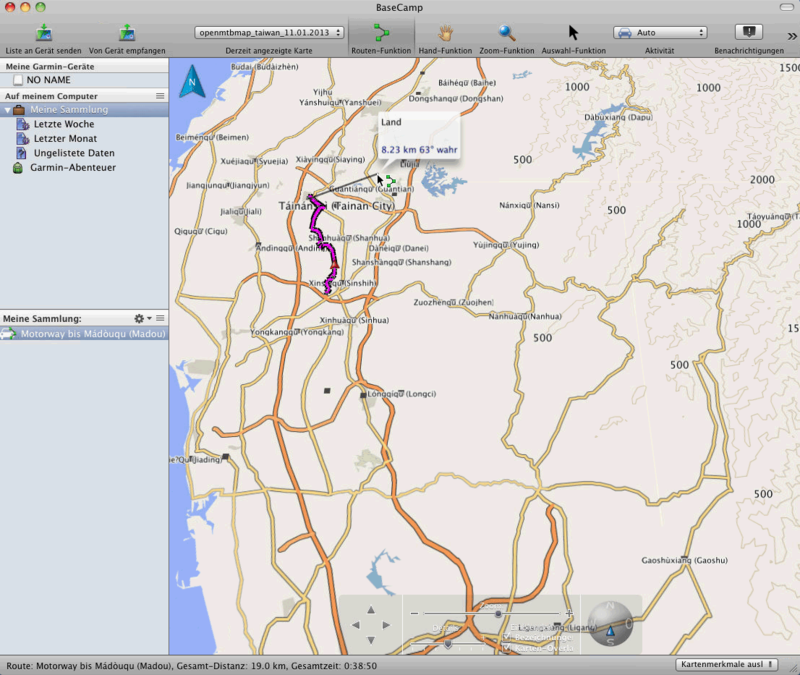 All maps support autorouting - I recommend you to use the "routing-function". It's the easiest and quickest way to create routes. I recommend to set the profile to "Car" (German Auto) or "Bicycling" for best results - Read through here for understanding how the Openmtbmap works with Autorouting and which avoidances you should activate/deactivate. - here you can see a quick sample route. After planning wit the Routing-Function, you can finetune the route using the Select Function and drag it around like on Google Maps. Then rightclick on the map (in this case mtbtaiwan.gmap): and choose "Show Package Content" - it should the third entry. In German on the example here it is "Paketinhalt zeigen". 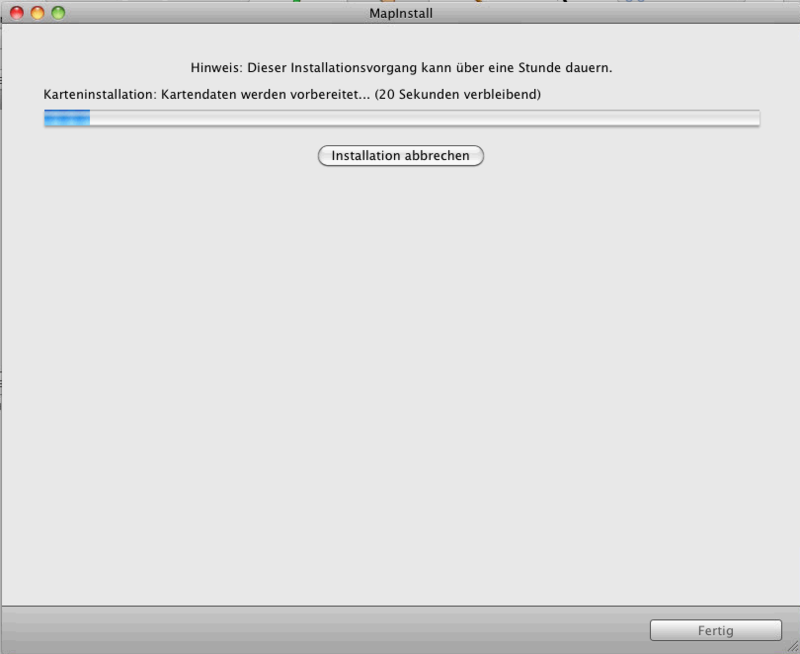 Here you see how the Mapinstallation folder looks like. In the "Layout Files" section - the different map layouts are saved. Open the folder Layout Files, then choose the desired Layout folder (e.g. Classic_Layout), go into it, and copy the typXX.TYP file. 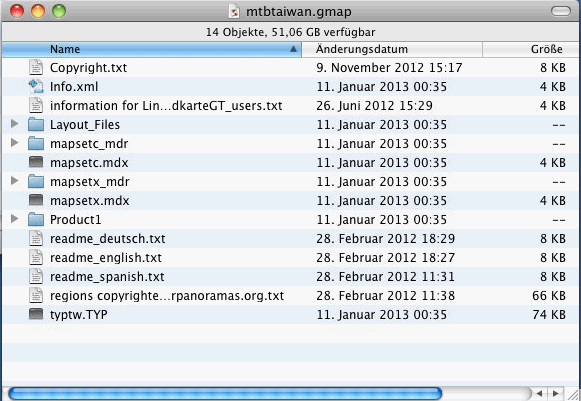 Go up again to the main folder (mtbtaiwan.gmap) and just paste it in, overwriting the old (in this case) typtw.TYP. 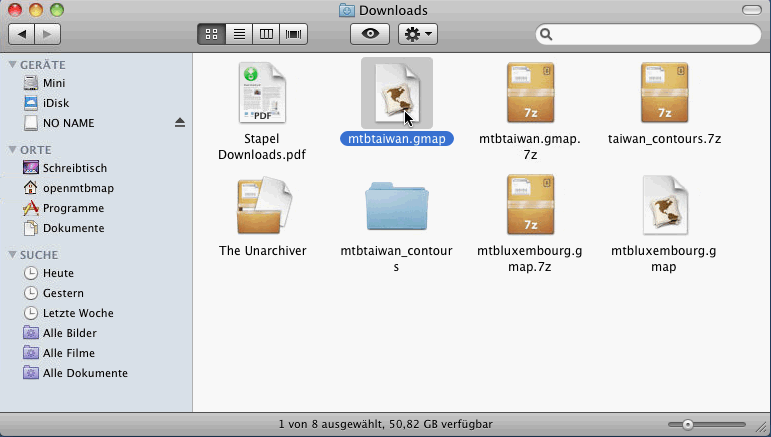 a) Two folders to enable/disable showing the contourlines. "Integrate Contourlines" with an Info.xml inside to enable the contourlines and "Remove_Contourlines with an Info.xml to disable the contourlines in the map. Just copy/paste the Info.xml from here to the main folder, i.e. mtbtaiwan.gmap and overwrite the Info.xml in there. by default the contourlines are active for all maps that have contourlines integrated and not in a separate download of course. 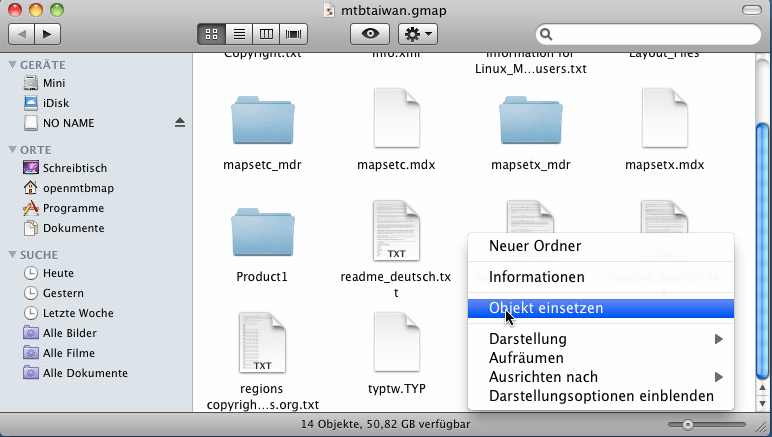 b) The map layout folders with a .TYP file inside. Dekstop_Layout - low contrast for working with Basecamp. So you copy the typXX.TYP and then paste it inot the main map folder - i.e mtbtaiwan.gmap, then you have the new layout activated. Note, you must no have Basecamp open at the same time, else the file is locked and cannot be overwritten! Here I'm copying typtw.TYP from the Classic_Layout. and finally confirming the overwriting - that's it. Once you've done it once, it's easy. (~ being your Home Folder). NOTE: on Old GPS all maps have to be sent at once. And can then be activated/deactivated via Menu on your GPS. (old GPS e.g. Vista HCx, GpsMaps 60 CSx). On new generation GPS (e.g. Dakota, Oregon, edge 800, GpsMaps 62, Montana), you can send the maps one at a time as you like. We choose the region not by left clicking into it, but by dragging the mouse over the region we want - while holding the left mouse button (else you miss the contourlines)! I selected a second map, by choosing another map on the MapSelector in the image above, and also choosing the region I want. Note that you shouldn't overload your GPS device with maps. I recommend max 2GB for old Garmin GPS, and 4-6 GB of Maps maximum for new generation Garmin GPS devices. Note also there is a limit of 2048 or 4096 maptiles depending on your GPS device. If you put too many maps onto it, then starting the device will be slow, and using the search function will be slow too. The Openmtbmaps are based on Openstreetmap, hence you can help to improve the map data! vielen Dank für die ausführliche Anleitung! 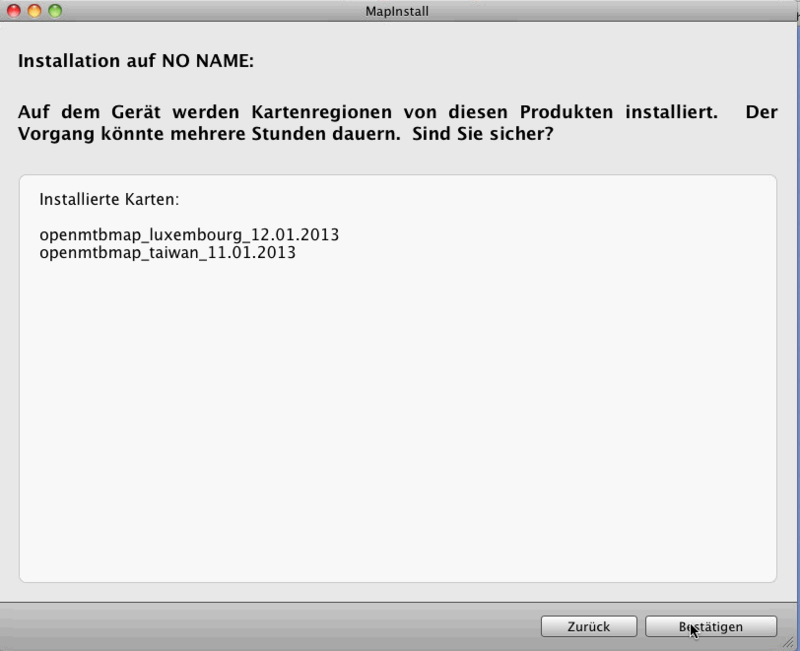 Leider funktioniert die Georgien-Karte (englische Version für Mac) nicht. 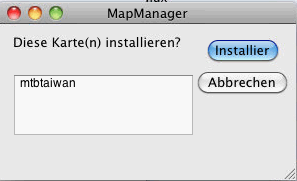 Mein Garmin etrex 30x meldet mir zu Beginn ‘Can’t Authenticate Maps. Contact content seller for help’. Hast du eine Idee? …….and it works brilliantly – thanks!! Have been downloading new versions of South Africa and GCC maps. I have contour files from 2 years ago. The maps download and install fine, but I just can’t get either map to show contours. I’ve done it a couple of times to see if I was missing a step (so have all the 7* files in the Product1 folder, and have also copied info and typ files….. any possible missteps? You need new contourlines – I’ve updated them about 1 year ago! Delete the old ones (else it could be problematic) and make sure to copy in the new ones. Ui – dass ist ja ein arg verschachtelter Pfad. Ich werde den oben mal im Tutorial hinzufügen.